The UDP Broadcast feature is used to transfer values through One Way Networking with communication diodes that only allow traffic to go one way. This networking is only needed when bidirectional communications is not allowed. Use the following steps to setup servers to broadcast data and receiving services to update local tag values from the broadcasting nodes. The receiving nodes need to have a fixed IP address, registered domain name, or network node name. The broadcasting nodes do not need to have a fixed IP address. 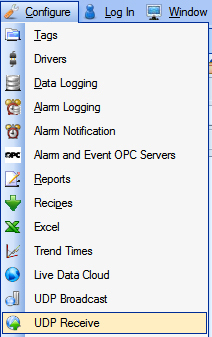 From the data source service select Configure-UDP Broadcast. 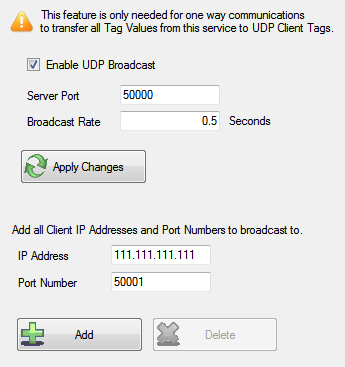 Click the CheckBox to Enable UDP Broadcast and enter the Server Port number and Broadcast Rate which is the rate all values from this service will be broadcast to the receiving clients. Enter each receiving client IP Address and Port Number and select Add. Save the file myUDPBroadcastServer.UDPBroadcast in the directory of your choice. You can specify for this configuration to load automatically when the Service starts using Configure-Options to specify this default UDP Broadcast file. From the receiving service select Configure-UDP Receive. 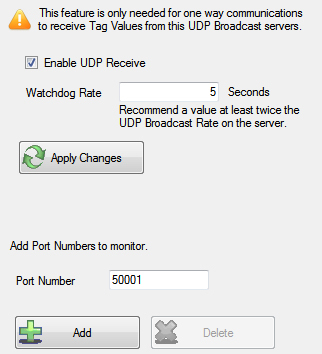 Click the CheckBox to Enable UDP Receive and enter the desired watchdog rate. The watchdog rate is the amount of time it will wait before setting the receiving tags quality to bad without receiving a broadcast. Enter a Port Number to listen on and select Add. You can enter multiple receiving port numbers. Save the file myUDPBroadcastClient.UDPReceive in the directory of your choice. You can specify for this configuration to load automatically when the Service starts using Configure-Options to specify this default UDP Receive file. In the receiving node select Configure-Tags. Add Tag’s with the Data Source of UDPClientTag and enter the Tag name of the broadcasting node you want to receive the value from. 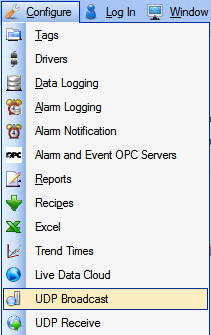 Save the Tag Configuration file and specify it to load automatically under Configure-Options-Default Files.